Having grown up outside Aberdeen, a career in oil and gas was not on Eilidh McKay’s radar when assessing her options when leaving school – so much so that she opted to study sports and exercise science at Robert Gordon University. After graduating, science-focused roles in oil and gas started to appeal but it was only after starting as a laboratory technician at Westhill-based Tendeka that she realised how many engineering opportunities there were in the industry. Over the last six years, Eilidh has broadened her skills and is now Technical Support Manager at the independent global completions service company, having recently been promoted from Applications Engineer. “Engineering was not something which was encouraged when I was looking at career choices prior to joining Tendeka,” Eilidh said. Eilidh says the standout moment in her career so far was helping secure Tendeka’s largest ever swells contract which was helped by a change of mindset. “I helped develop a rubber compound which secured the biggest swells contract for the company and has since been successfully used over 4,800 times in multiple Tendeka products. It’s something I’m really proud of. “From a personal angle, I’m also proud to be in my current role within six years of joining the company, managing my own team as Technical Support Manager. That’s something I would never have anticipated. “A change of approach really helped. Prior to starting at Tendeka, I believed the negative perception regarding women in the oil and gas and assumed this would be something I would experience. Due to this, I lacked confidence in my ability, as I was female, I was young, fresh out of university and had no experience or education in oil and gas. 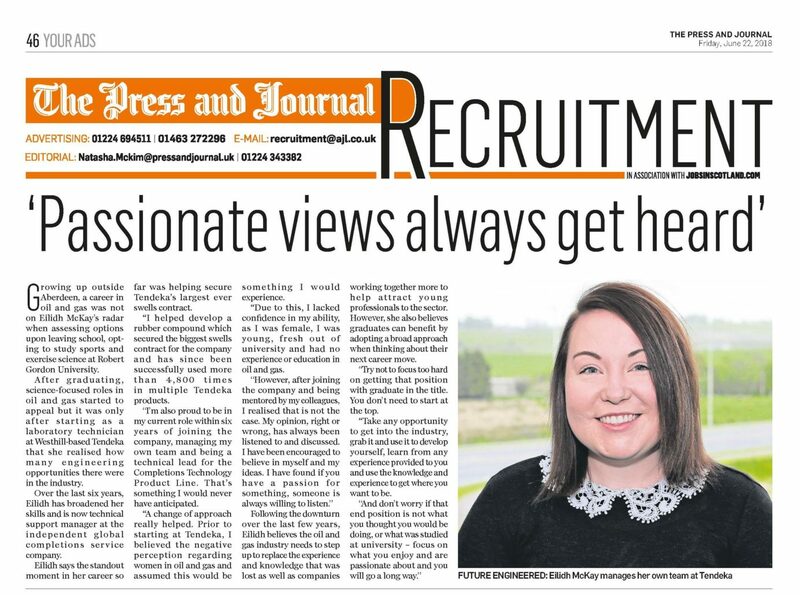 Following the downturn over the last few years, Eilidh believes the oil and gas industry needs to step up to replace the experience and knowledge that was lost as well as companies working together more to help attract young professionals to the sector. However, she also believes graduates can benefit by adopting a broad approach when thinking about their next career move. “Try not to focus too hard on getting that position with ‘graduate’ in the title. You don’t need to start at the top. Take any opportunity to get into the industry, grab it and use it to develop yourself, learn from any experience provided to you and use the knowledge and experience to get where you want to be.